An employee with Southwest Airlines went the extra mile for a young girl and her family who had to cancel a planned trip to Disney World. 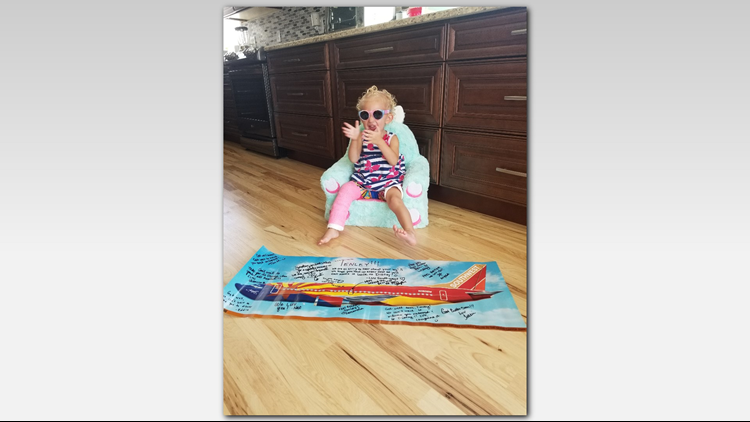 DENVER — Next week the Hahl family was supposed to fly to Orlando for a trip to Disney World, but those plans changed when their middle daughter broke her leg. The family of five planned to head to Florida on Oct. 17. Late last month, their two-year-old daughter Tenley suffered a spiral fracture in her leg after jumping into a foam gymnastics pit, her mom Lindsay told 9NEWS. As a result of the fracture, Tenley was put in what's called a Spica cast. They're usually used to treat a condition such as hip dysplasia and typically include the trunk of the body and one or both legs. Children with them are unable to stand or bear weight. Tenley's mom said her cast begins at her chest and extends down to her toes on one side. Her "good" leg has a cast down to her knee. The cast meant that taking her to Disney or even on a plane would be difficult so they decided to cancel their planned trip to Disney World. Hahl said she contacted Southwest Airlines and even though they had non-refundable tickets, a representative bent the rules and gave a full refund to the family. It didn't stop there, Hahl said two days later FedEx showed up at their door with a delivery for Tenley. It included a Southwest Airlines poster filled with good wishes from employees. "It is above and beyond the call of duty and was completely unnecessary to refund my tickets and send her something special," Hahl said. A spokesperson for Southwest Airlines confirmed the kind gesture and identified the representative as Tim. 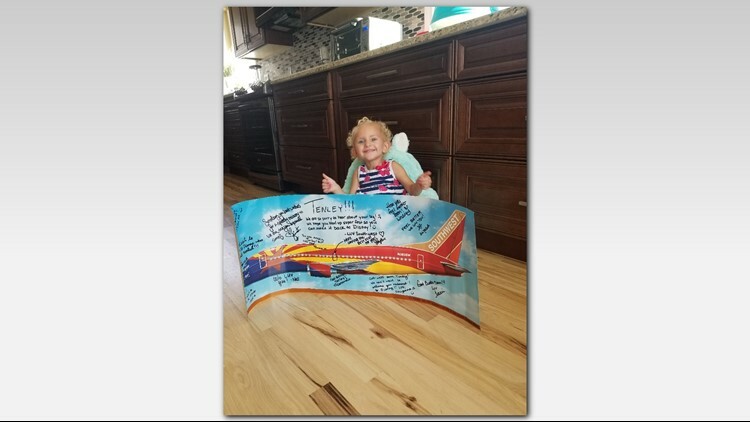 The spokesperson said Tim felt any child that had a trip to Disney World canceled would need a little “pick me up,” so he decided to send them the poster with encouraging messages from him and his fellow Southwest Customer Relations Representatives.